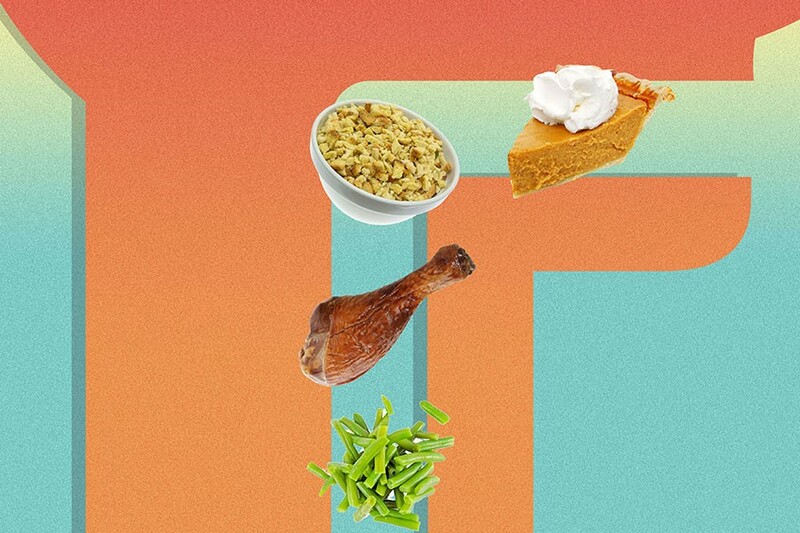 In the marathon of a meal that is Thanksgiving dinner, should you eat the food in any particular order? You’ve probably never considered there being a proper to what you should eat on your Thanksgiving plate: If you’re anything like us, you just fling yourself face-first into a pile of food and try to inhale as much of it as possible, maybe pausing to chew every now and again. According to Canary, you want to eat soluble fiber (green beans, salad, etc.) before going for the starchy carbohydrates (potatoes, cornbread, etc.) in order to slow down the latter’s digestion and absorption. “Think of digesting carbohydrates like pouring a glass of milk down a waterslide: It goes down pretty fast,” he says. “Soluble fiber is like a bunch of sawdust that you shake up with the milk. Now when you pour it down the slide, it will move much slower. Essentially, the fiber slows down the speed at which you absorb nutrients, so you want to eat these first.” As you’ll soon see, slowing your digestion by starting with the vegetables helps you avoid spiking your blood sugar, so seriously, hit the veggie tray hard during the appetizer round. When you save the carbs for after the salad and turkey, you help fend off the food coma. “By slowing down your body’s absorption of the starchier and simple carbohydrates, you’re actually lowering the blood sugar spike (and crash) that comes from those foods,” says Canary. On the flip side, flooding your system with carbs causes your blood sugar to rise above normal levels, which in turn triggers the pancreas to release insulin to level out the blood sugar. This is what makes you tired; it’s also what makes you fat, since all that extra glucose in your body gets stored as fat. Booze is often a staple of the Thanksgiving meal, but since it goes with everything, it’s a little harder to say where in the digestion track meet it should sit. However, Canary warns not to go overboard on the booze for reasons beyond the usual (alienating your family, etc. ): Basically, alcohol wreaks havoc on your digestive system, which isn’t ideal when tackling a giant meal. “Alcohol causes inflammation in your digestive system and creates a more acidic environment, which can lead to indigestion,” says Canary. So if you want to finish Thanksgiving unscathed, take it easy on the booze — no matter what point in the meal you start drinking it. In the end, if you follow this advice — go slow with the booze, eat your veggies first, then fill up on meat followed by carbs and dessert — you really might avert the epic turkey-carb-wine crash, and possibly even stay awake long enough to see the New York Giants attempt to play football.